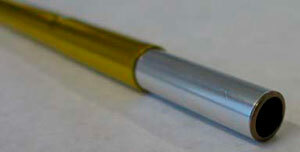 Gold colored pole with a silver metallic, 8.2 mm wide insert. Inside the insert there is a bronze metallic pipe sticking out about 1 mm above the edge. There is a soft transition about 35mm in from the ends of the pole between the middle of the pole and the wider ends (marked here by black arrows) where the diameter is 9.5 mm. The writing on the pole is in white text, as shown to the right. A gold colored pole with a silver metallic, 8 mm wide insert. Inside the insert there is a black pipe sticking out about 1 mm above the edge, as shown to the right. The outer diameter of the pole is constant along the entire length. In 2017 we redesigned the Anjan, Anjan GT, and Rogen to use the same DAC featherlite NSL 9 mm poles as the rest of our tents. Before 2017 the Anjan, Anjan GT, and Rogen used DAC featherlite NSL 9 mm poles with lock tips. 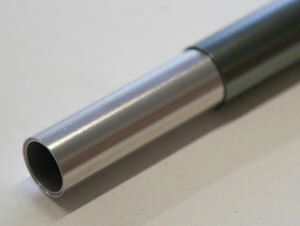 A grey/green colored pole with a silver metallic, 9.8 mm wide insert. Inside the insert there is a blue pipe which is sticking out about 1 mm above the edge. There are two soft transitions, about 35 mm from the edges of the pole (marked here by black arrows), between the middle and the wider ends. The ends of the pole have got a diameter of 11 mm. The writing on the pole is in white text, as shown to the right. A grey/green colored pole with a silver metallic, 8.5 mm wide insert. Inside the insert there is a black pipe sticking out about 1mm above the edge of the insert, as shown to the right. The outer diameter of the pole is constant along the entire length. A black colored pole with a silver metallic insert. The insert has a diameter of 9.5mm. The outer diameter of the pole is constant along the entire length. These poles were used in the Atlas models until 2013. They are currently used in the Atlas Vestibules. A grey/silver colored pole with a silver metallic insert. The insert has a diameter of 15.5mm. The outer diameter of the pole is constant along the entire length. These poles are used in the Atlas and Stalon XL models. If your poles do not match any of these descriptions they are one of the pole styles we used before 2003. We no longer carry pole sections for these poles. If you need to replace a section of your pole you will need to purchase a new pole of the correct length. If you are not sure what type of poles you have or what type you need please contact us and we will be happy to help you.